Practically every musician has a YouTube account. But when it comes to promoting and growing a fan base, many musicians struggle. In this guest post via Sarah Jacobs, you’ll have the opportunity to learn about steps you can take to get your videos out there to more people. If you think you’ve got the stuff, you may want to consider contributing a piece to The Music Entrepreneur HQ yourself. Now, let’s move right into Sarah’s post. So, you’ve written a few songs, and you’ve posted some videos online – but you aren’t getting any views! What are you doing wrong? 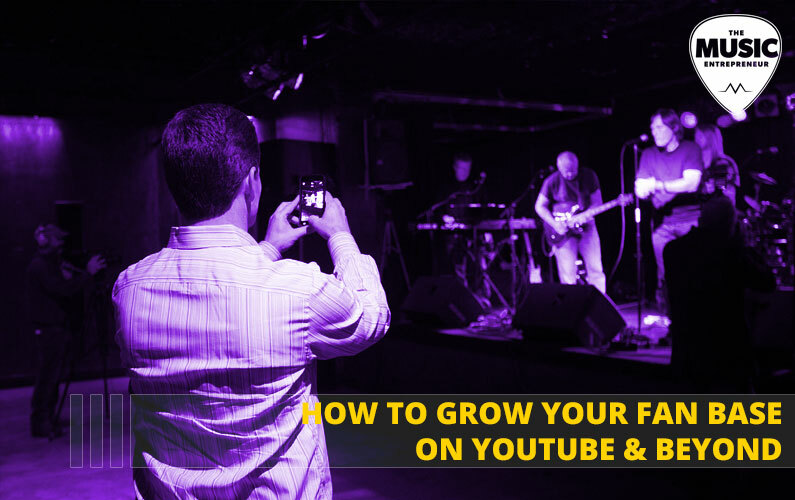 Well, here are a few tips from actual artists and recording labels on how to get your music noticed on YouTube and, eventually, by big labels. If you want to get noticed, you can’t just film yourself playing any old song and post it to YouTube. Many artists want to get their original material noticed, but it may be necessary to capture the attention of your audience with a well-selected cover song to start gaining some traction. Many of the big names on YouTube found some success this way. Just look at Igor Presnyakov or Pomplamoose. Find a song that’s popular and record yourself singing or playing it. Choose a song people already know, so they’ll be more tempted to click on your video. Now, you may have the audio squared away, but what about the visual aspect of your video? Your video must be attention-grabbing. Specifically, the first 15 seconds of your video are crucial, and must draw people in. Then, continue to hold their attention with eye-catching visuals and a storyline. If you aren’t sure how to achieve this, consider studying a variety of videos from artists in different genres to get a sense of what they’re doing. Before filming, draw out a storyboard and plan your video, so your filming goes smoothly and you capture the exact footage you need to engage viewers. So, you uploaded your video. If you do nothing, you’ll probably only get a few views. Now what? Now you must promote yourself. There are many ways to do this. For instance, Twitter is one of the biggest social media platforms out there, and a lot of artists use it to get themselves noticed. When sharing your music, use popular hashtags like #nowplaying or #MusicMonday to draw more attention to your videos. Don’t forget to tag if it’s original content or if it’s a cover. Share your posts multiple times to hit the widest audience. Facebook is also an important platform for artists. If you don’t have one already, create a page! Post your videos and add links from your YouTube channel. Use hashtags. Another surefire way to get noticed is to ask other people to promote you. There are channels, pages, or accounts that will post your video with links to you to help you reach a wider audience. Connections in the music industry are crucial, so get out there and network. Now, you’ve got some fans liking your videos. To keep those fans, you must stay consistent with your publishing schedule. Keep to it. You don’t have to release a new music video every week, but you can release behind-the-scene clips, Q&A’s, sneak peeks, etc., anything to keep your fans roped in. Start a weekly vlog. Post a few reaction videos. Dabble in all sorts of different areas and find out what you’re good at and what gets the best reactions from your fans. Once you’ve got a solid fan base, you can start releasing original music content. But don’t just rely on the strength (or weakness) of original material to carry you. Continue releasing cover songs keep luring in new fans. Don’t forget to thank your fans. The fans make your career! Fans love being thanked by their favorite artists – it makes them feel all warm and fuzzy inside. Invite them to ask questions for Q&A videos, reply to or like comments, check out their profiles. Even a simple follow back can mean the world to a fan. People don’t like artists who are rude to their fans. Appreciate the people who support you, and you’ll have a very tight-knit and dedicated fanbase. Try out different styles and genres. Don’t be afraid to cover a new genre, artist, or write something different than usual. Try releasing just instrumentals. Sing some mashups of popular songs. Sing a pop song in a rock style. There are so many different things for you to try. Look up some popular artists on YouTube to get an idea as to what kind of content people like. It will not only give you more visibility, but it will also help you cement your own unique style. Remember – always stay original! Don’t rely on YouTube to build your career. Join SoundCloud, BandCamp, Rormix, and so on. Restricting yourself to one platform lowers your chances of getting noticed. YouTube may be among one of the most popular sites out there, but that also means it’s the hardest to get noticed on. Find some other artists near you who are willing to collaborate with you on some songs. Not only will your fans be watching, but their fans will also be watching. Collaborating with higher profile musicians will help your visibility, and allow you access to their fan base as well. No other artists nearby? Ask other artists to cross-promote with you! Building a network of other artists is essential to making it big in the music world. See if some of your favorite artists would be willing to help you out. Making music should be fun. If you’re not feeling it, or if it’s too much for you to handle, cut back. Maybe post a little less often, or find something else to do. Music isn’t for everybody, and the industry is a tough place; there’s no shame in choosing a different direction. But for those of you who dream only of performing, don’t let a few bumps in the road tear you down. As the saying goes, it’s always darkest before dawn. Stay strong and play on! This article was written by Sarah Jacobs, blogger at Know Your Instrument. Sarah is a regular writer on issues related to music, and focuses specifically on the acoustic guitar. When not writing, Sarah enjoys taking her two pet dogs on long walks.